How Can Insulation Save Money? A beautifully insulated home does more than keep you warm in the winter and cool in the summer. It also reduces energy costs by ensuring the building envelope is as energy efficient as possible. After all, there is more to home energy efficiency than turning off the lights when they are not in use. If you would like to save money while improving the carbon footprint of your home, it is critical to understand the basics of building science to make informed decisions regarding your insulation investment. To start, let’s define the building envelope. An automatic response when it starts to rain is to head indoors, where you will be protected from the deluge. This protection against the elements is thanks to the building envelope of your home. An energy efficient building envelope will masterfully control indoor temperature to keep heat and air-conditioned air in while keeping unhealthy levels of moisture out. The building envelope consists of your home foundation, above-grade walls, windows, doors, and, of course, the roofing system. Although the building envelope protects you and your loved ones from the great outdoors, its efficiency is dependent upon its ability to control airflow. If the envelope is not energy efficient, heat loss can occur. In fact, the gaps and holes in a building envelope can contribute up to 40% of energy loss in a home. If there is heat loss, there could be issues with moisture. After all, warm air holds onto water vapour, and water vapour can turn into liquid water given the right condition of relative humidity. A home needs some humidity, but too much can facilitate paint to flake, windows to sweat, and mold to form and spread. Once mold takes hold in your home, you will need to spend your hard-earned money on remedying the situation. This is why it is so critical to ensure the building envelope of your home can control heat flow. Before we describe how insulation has an impact on heat flow, we need to set something straight. While it is true heat can be lost through the ceiling and attic roof, these two areas are not the only structures in a home through which heat escapes. In fact, the entire envelope can be susceptible to heat loss, regardless of whether it is a north-facing wall or right-facing window. This is because heat moves from hot to cold. If every area of your home is insulated except for the basement floor, heat is going to flow down to the basement and from there it will make its way outside. A floor without any insulation can be responsible for up to 40% of your home’s lost energy. For heated, non-insulated floors, the amount of energy loss could be up to 50%. Without insulated flooring, your heating and cooling systems will have to work on overdrive to compensate for this energy loss, and all you will have to show for it is a high energy bill. Insulated floors keep warm air inside during the winter and help to keep your home cool during the summer, all while reducing the amount of effort expended by your furnace and air conditioner. If you are interested in insulating your floor as a measure by which to lower your energy expenditures, take a look at our Insta-Panels insulation system approved for under slab concrete floors and radiant heating. Our floor insulation system offers superior R-value without breaking the bank. To understand how efficient an insulation system will be at resisting heat flow, you will need to learn its R-value rating. An insulation system with a high R-value will save you money on your energy bills because it will reduce the rate at which heat flows through the envelope, which means heat will not be wasted and lost to the great outdoors. Keep in mind, there are factors to consider when choosing the right insulation R-value for your home, such as the climate zone in which you reside and the location of where the insulation will be installed. Moreover, there are external factors that can affect the R-value of some insulation systems; for example, traditional pink fiberglass loses its R-value if it becomes saturated with water or is exposed to extreme changes in temperature. Once this insulation is damaged, it should be replaced, which means more money out of your pocket. There are insulation systems that do not soak up moisture and promote mold growth, but fiberglass isn’t one of them. At the moment, there are quite a few misunderstandings about fiberglass and water absorption that are circulating the Internet. Does fiberglass absorb water or doesn’t it? To figure out the answer to this question, we must take a look at what constitutes fiberglass. Mold is more than an eye sore. It can reduce the resale value of your home, and it costs money to fix. Because fiberglass can be damaged by water, is there an insulation system that is water resistant as well as cost effective? Yes, and it is called cellulose insulation. Unlike the resin and paper backing in fiberglass, cellulose itself is not directly responsible for mold growth. Can cellulose become moldy? In extreme scenarios, yes it can. By extreme, we mean if there is a flood or leak, and other areas in your home have also sustained water damage. In normal conditions, cellulose will wick water away from the insulation when it comes into contact with moisture. This helps to keep the cellulose dry. In addition to protection against water saturation, cellulose also provides excellent air sealing, especially compared to fiberglass. As such, cellulose insulation is cost-effective and will help your building envelope do what it is supposed to do, all while keeping energy costs down. We saved the best for last. This system is called closed cell medium density spray foam. It is a 2-in-1 approach to home insulation because it both seals and insulates, which means you do not need to install a separate vapour barrier. Because of its exceptional properties, it does not absorb moisture. Closed cell medium density spray foams deliver superior thermal and airflow control, which helps to keep energy inside the building envelope, which will save you money. There are open cell spray foams on market today, but these may require the installation of a separate vapour barrier; however, at Insta-Insulation, we only use closed cell medium density spray foam. But what about the cost of spray foam? It is true the initial cost of spray foam is typically more expensive than fiberglass insulation; however, spray foam out performs fiberglass on many levels. Closed cell spray foam systems deliver high R-values, regulate indoor temperature beautifully, do not absorb water, and will not become riddled with mold. In most cases, spray foam insulation will pay for itself within three to six years. You will also see an increase of up to 20% in savings on your energy bills. Furthermore, when you go to sell your home, you will see an increase in resale value. There is no reason to waste your hard-earned income on air and heat you don’t even get to use. 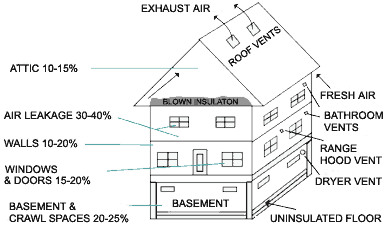 It is more sensible to invest in an insulation system for the building envelope of your home. If you’re interested in learning more about how installing new insulation can be beneficial to you, give us a call at 1-800-668-0311. One of our representatives will help you set up a free home insulation inspection.